An unusual polymorph of the accessory mineral chromite, (Fe,Mg)(Cr,Al)2O4, has recently been discovered in the shock veins of the Suizhou meteorite. This backscattered electron image of a grain of the meteorite shows light-colored bands corresponding to the post-spinel, calcium ferrite (CF)-type phase of chromite. 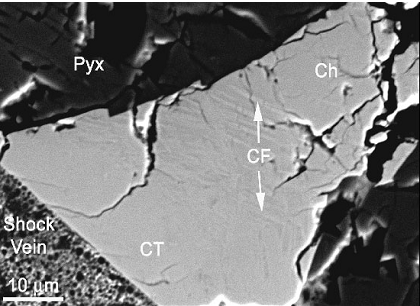 The higher-pressure calcium titanate (CT)-type phase is also evident within the chromite (Ch)-pyroxene (Pyx) matrix. High pressure-high temperature synthesis experiments carried out with the laser-heated diamond anvil cell technique show that the chromite (spinel) phase transforms to the CF structure at 12.5 GPa and then to the CT structure at approximately 20 GPa. These experiments were performed at beamline X17C of the National Synchrotron Light Source, Brookhaven National Laboratory and the results have been published in M. Chen et al., Proc. Nat. Acad. Sci. 100, 14651-14654. For more information, see also the BNL online report.